The ability to rhyme is important in building phonological and phonemic awareness. In other words, making sure a child is able to understand when words rhyme will help with their reading and spelling. February’s free extra sheets look at rhyming and are in three sections: one section each to go with levels 1, 2 and 5 of the Froggy Match-it app. The sheets can be completed independently by most children. We have found that they also work well when done in pairs: two children working together to work out possible answers and complete the tasks. They can take turns holding the pen if necessary! Get the rhyming sheets here. As you may know, each month we give away a set of extra worksheets that help with phonics. These extra sheets are available from the Froggy Match-it website and are completely free. 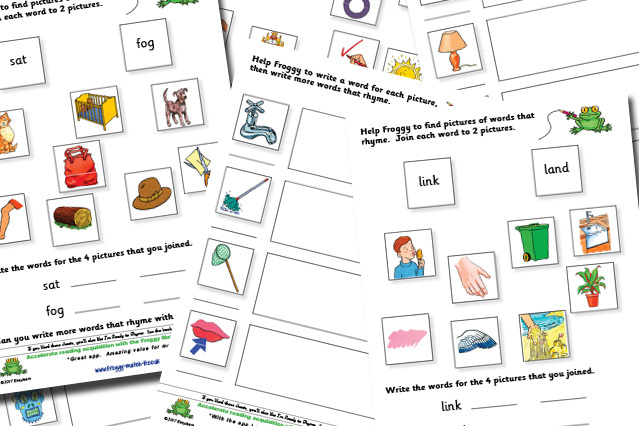 All those who follow Froggy Match-it on facebook or twitter or subscribe to the emailing list will be the first to know about each new set of free phonics worksheets.